Unfortunately, true Augmented Reality technology for general public use is still far away into the future. The sad truth is that everyday affordable computing devices (tablets, smart phones and computers) are not equipped with the sensors needed to support accurate enough readings of their position, surroundings, orientation and movement to provide stable environment for adding virtual objects on top of the world around us. To overcome this problem, current projects in the genre use GPS location technology, image recognition and printed AR markers, but all three are still somewhat inacurate and very dependent on external conditions. To provide more stability and to make it possible to use indoors, we came up with the idea to take advantage of scannable quick response codes, physically positioned in the surroindings of the player, therefore creating augmented game world in a small and safely confined area. The acceptance of this idea and the feedback from customers and consultants made us file for a patent on this implementation process back in the summer of 2017. 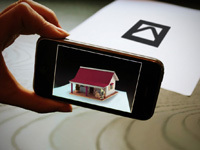 Want to check out our Augmented Reality Games? Click Here! While very successful at other ventures in the past, most of which not even related to computer gaming at all, our leading game designer Peter Agapov is a very well known branching narrative expert and researcher. He is famous for his Gamebook Theory posts on LloydOfGamebooks.com and the work of analyzing the meaning of choices in gaming and in real life, as well as the psychological effects of games from various genres on people ages from kids to adults. You can find more on the latter at his blog named Visual Gamebook Adventures. 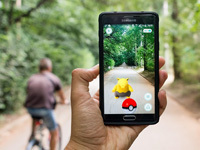 Although, due to various reasons such as business contracts, intelectual property laws and geographic area restrictions, we don't have all of our games and products available on the market, you can still visit our e-store on eBay and purchase some of our Augmented Reality Games listed for sale there. US and International patents pending for quick response augmented reality and location based technology used in our adventure games. Written permission from Sipko Software must be obtained before developing games implementing the same idea or any similar approach.